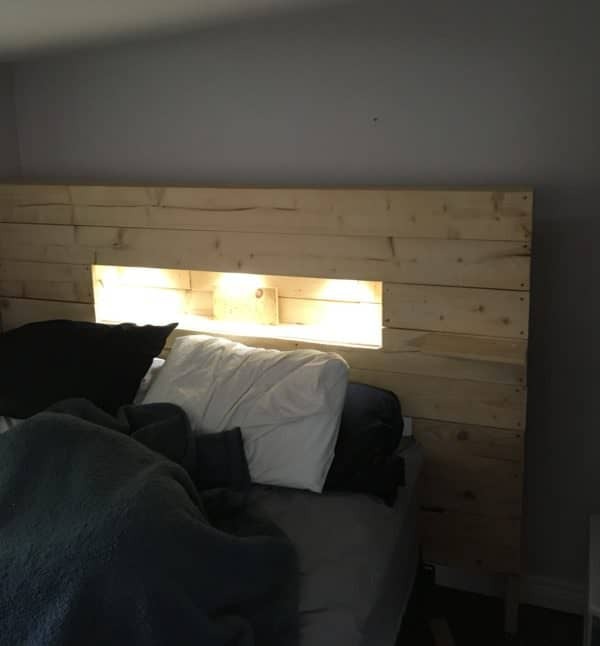 I made the frame first for my LED-Lit Pallet Wood Headboard. I measured exactly where I wanted the shelf and how big. Additionally, I used 2x4"s and 2x6"s in the frame and headboard. Create a terrific light source without sacrificing space on your bedside tables with this LED-Lit Pallet Wood Headboard. This headboard is an excellent idea for spare rooms, too! I used 2 x 4's for the frame of the shelf and 2 x 6s for the frame of the headboard. Once I had the frame all screwed together I used 1 x 6"s for the front of the headboard. This project took me about two hours to complete. Never knock over a bedside lamp again. Build the lights right into your headboard! Light up your room with this super-cool Geek Couch! Turn your vinyl records into a desk lamp.